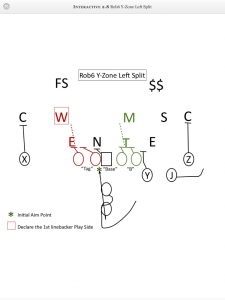 Why might a coach want to check out 101+ Pro Style Pistol Offense plays? According to a report by the University of California, San Diego, American’s consumed 3.6 zettabytes of information in 2008. That was about 34 gigabytes per person everyday. In 2010 it was estimated that data production doubled every 11 hours. It is now 2013 and many of us have a phone in our pocket that is more powerful than most laptops were 2 years ago. As a result, it is likely we are now consuming more information. As coaches, we try to consume as much new football information as humanly possible in the off-season. To this end, we are continually adopting new tools to make our learning more efficient and improve our ability to teach our athletes. We read blogs, use HD video on Hudl, attend webinars, buy coaching books, follow each other on Twitter, and attend thousands of clinics in the spring. It’s overwhelming at times. Fortunately, coaches are often creative and use new tools in useful ways. 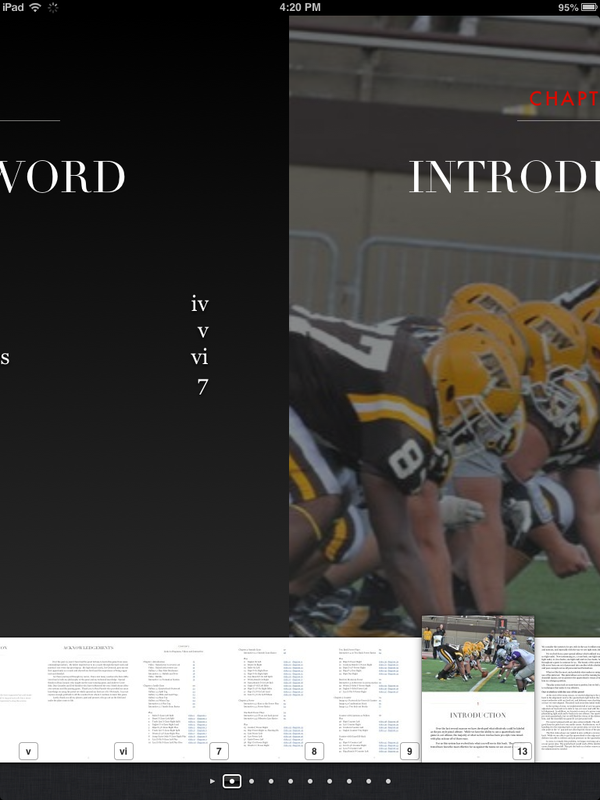 Baldwin Wallace University offensive coordinator Keith Grabowski has produced a book on the Apple iBooks platform that is one of a kind and very interesting. His book, 101+ Pro Style Pistol Offense Plays, is the focus of this edition of Ride and Decide. If you are in education and you keep up with technology, you are likely aware of what iBooks is doing for the classroom. It is moving the textbook and other learning resources to a new level of interaction and scope that will probably revolutionize the way we teach our youth. So, lets take Coach Grabowski’s book for a Ride, and I will give my opinion on whether to Give or Keep. Keith Grabowski’s new coaching book is available on the iPad only. When you first download 101+ Pro Style Pistol Offense Plays on iTunes store and open it up you are greeted with the book cover, which opens up to an introduction video that gives a brief overview of what is included. This video demonstrates how to navigate through the material and shows some of interactive elements. This video plays automatically before sending you to the next section. Coach Grabowski then opens up with a Forward where he discusses the early evolution of his offense and a bit about the book itself. Right away we see another video, this time embedded in the book with the text. Once the first few paragraphs are read, the reader can play the video right on the page without leaving the document or going full screen. Of course, if the reader prefers, the video can be expanded to full-screen by reverse pinching the video as it is playing. In general, navigation is achieved by swiping across the screen to turn the page. After the Forward, we see a very comprehensive and well-linked Table of Contents. This allows the reader to immediately find and navigate to a specific section or play. Further navigation is possible by Pinching the screen. This action brings up a navigation experience that allows the user to access the content in a variety of ways. The first is the same as turning the page. Only this time, when swiped, the document navigates the user to the next chapter. Additionally, from this navigation view, the user can use a scrollable bar at the bottom of the screen that displays a thumbnail view of each page. The user can scroll through the pages and open any page by tapping the thumbnail. Navigation is easy and intuitive and very helpful. The Table of Contents has links to each section and play for easy navigation to exactly what is needed. Additionally, there are links directly to the videos and diagrams. Pages are navigated by dragging a finger across the screen. The user can also navigate by scrolling through the thumbnails seen at the bottom of this picture. Once again, this makes navigation very simple. The document consitsts of 8 chapters, starting with the Introduction. In the intro, Coach Grabowski goes deeper into the evolution of the system he uses and discusses some of the advantages he gets from the pistol. We also see the first instances of interactive content in the document besides video. 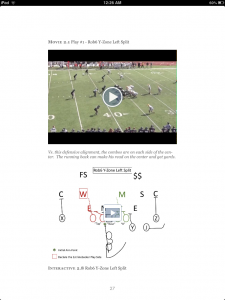 The first is a small gallery (labeled Gallery 1.1) of photos in which Coach Grabowski outlines a few of the mechanics of he teaches the run fake. Here he labels the pictures and provides a caption to further illustrate his concepts. A few paragraphs we see the second interactive element used to display content in the document. This one, labeled Interactive 1.1, provides access to a series of diagrams that can be viewed as a slide show. 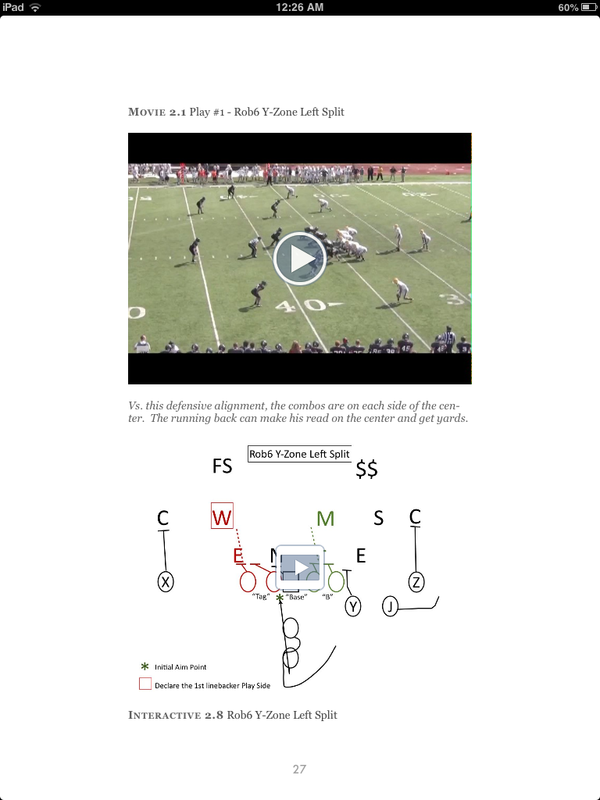 In this instance Coach Grabowski illustrates how he uses a few different screen concepts to protect his run game and the reader simply swipes accros the screen to move to the next slide. The third non-video interactive content used in the intro is labeled Interactive 1.2 and is similar to a Power Point presentation. It presents a main topic point and then introduces bullet points as the reader once again swipes a finger across the screen to move on to the next piece of information. 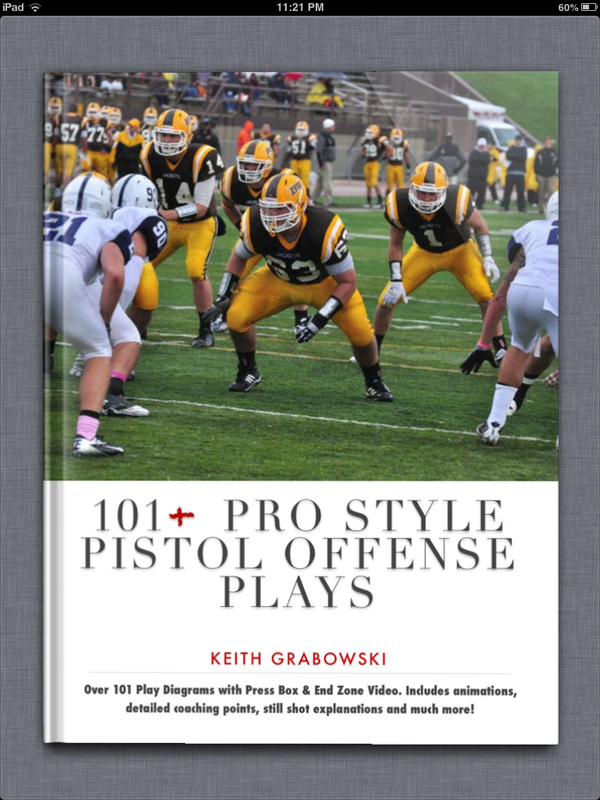 Once the Intro is complete, Coach Grabowski moves into the heart of his pro style pistol offense and discusses the Inside Zone in Chapter 2. Once again the text is complimented with a variety of interactive elements diagramming the nuances of the Inside Zone, Zone Read, and various Zone Insert concepts used at Baldwin Wallace. 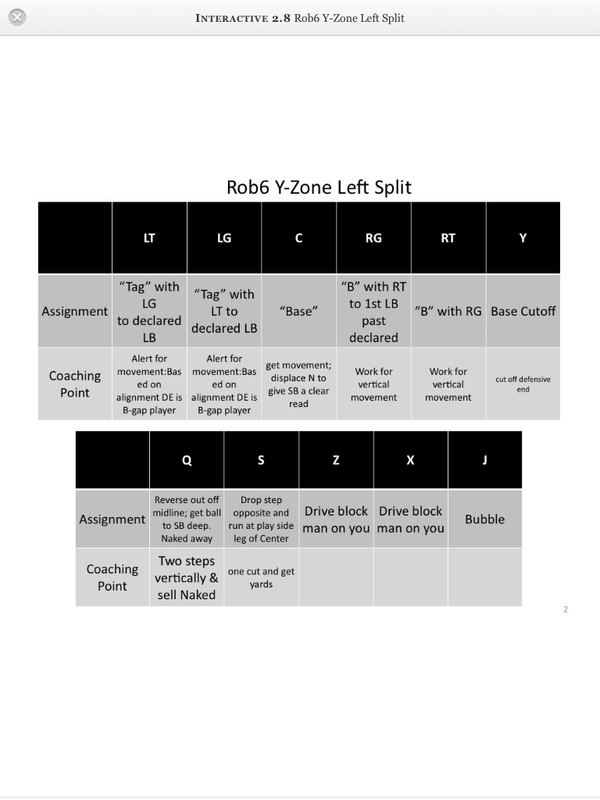 The way the material is presented really allows the coach to get a good understanding of the concept through a written explanation, video clips from both sideline and endzone perspectives, and in diagram form complete with positional breakdown of assignment. Coach Grabowski goes on with this process, presenting chapters on the concepts and variations of the Outside Zone, Power, Counter, Sweep, and Play Action Pass. 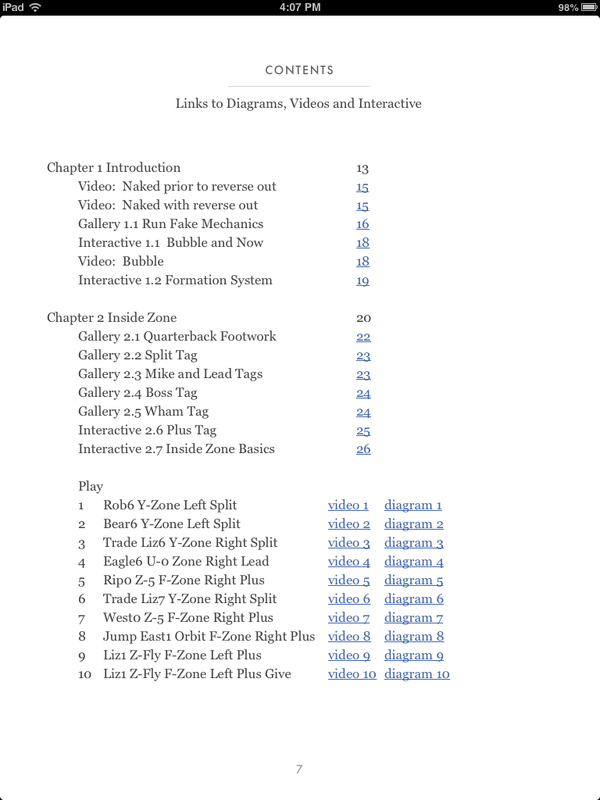 The result is a comprehensive overview of his offensive run game and play action pass concepts. The plays are presented with video clips and interactive diagrams. 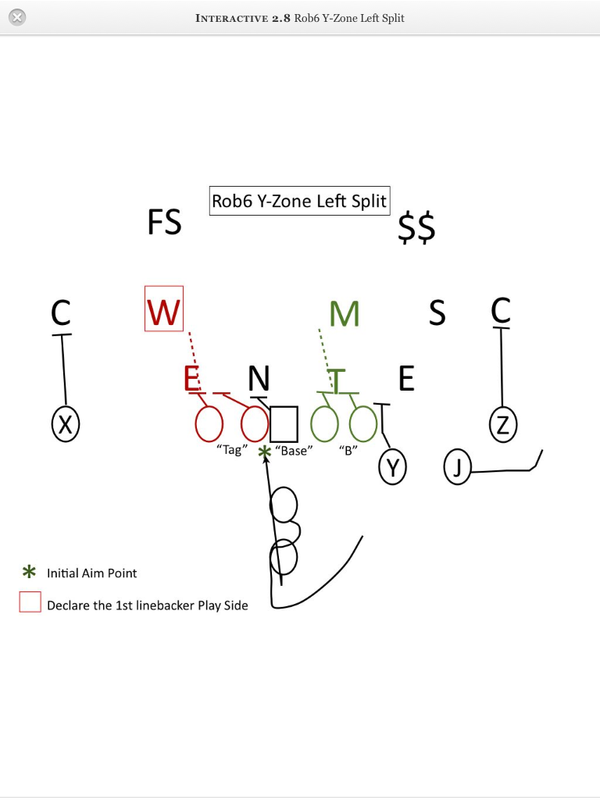 A diagram of one of the variations of the Inside Zone Scheme. Along with the diagrams, Coach Grabowski includes player assignments in an interactive slideshow. Coach Grabowski’s product, as I said above, is certainly unique. It uses the iBook platform and is based on and produced with interactivity as a central focus. As a result, it more efficiently presents the information, and does so in a variety of ways to make sure that the concepts are understood. It completely redefines what a “coaching book” should be and allows the author to really provide a thorough explanation of his topic. The exciting part is that Apple is likely continue adding to the interactivity functions of the iBooks platform, which will lead to even more interesting ways to help us assimilate more information quickly and efficiently. If you are a Pro-Style Pistol coach, enjoy learning new concepts, or just want to see the progress being made in interactive media, check out Coach Grabowski’s book. You will not be disappointed. It can be purchased through iTunes and you can see the book in action in the video below. NOTE: If you are not familiar with iBooks, you need to be aware that it is only accessible on the iPad. You can not view it on an iPod, iPhone, or Macintosh computer. Obviously Windows and Android devices are out as well.